'One way or another, illegal Arab town near J'lem will be evacuated,' Netanyahu says in Paris on 100th anniversary of World War I Armistice. Prime Minister Binyamin Netanyahu hit supporters of the 2015 Joint Comprehensive Plan of Action, better known as the Iran nuclear deal, during a press briefing in Paris Sunday afternoon, after arriving in the French capital for an event marking the 100th anniversary of the armistice which ended the fighting in the First World War. In response to questions from reporters at the press briefing, Netanyahu said there could be no long-term solution with the Iranian-backed Hamas terror group, given the organization’s explicit backing for the destruction of the State of Israel. Netanyahu also criticized supporters of the Iran nuclear deal, saying the arrangement empowered the Tehran regime to pursue an “empire of aggression and terror,” with the explicit goal of destroying the Jewish state. Netanyahu had been scheduled to meet with Russian President Vladimir Putin in Paris, though the meeting appeared to be in doubt last week, amid reports the meeting had been cancelled. Just minutes before the Israeli premier spoke to reporters, however, Interfax reported that the two leaders had in fact spoken on Sunday, citing Kremlin officials. The Israeli leader left for France Saturday night, to join dozens of leaders from around the world at the Paris Peace Forum, at the invitation of France’s President Emmanuel Macron. During the press briefing, Netanyahu confirmed that he had spoken with Putin, saying that he had spoken with numerous world leaders including President Donald Trump and the Russian leader. Netanyahu declined to provide details regarding the content of his conversation with Putin. The Prime Minister jokingly referenced the recent dustup between President Trump and CNN reporter Jim Acosta, which ultimately resulted in the revoking of Acosta’s White House press credentials. While Channel 10’s Barak Ravid pressed Netanyahu on the recent ‘submarine scandal’ involving the Prime Minister’s personal attorney, Netanyahu interrupted Ravid’s line of questioning to warn him – sarcastically – not to follow in Acosta’s footsteps. “Let’s not have another ‘CNN’ here,” Netanyahu said. 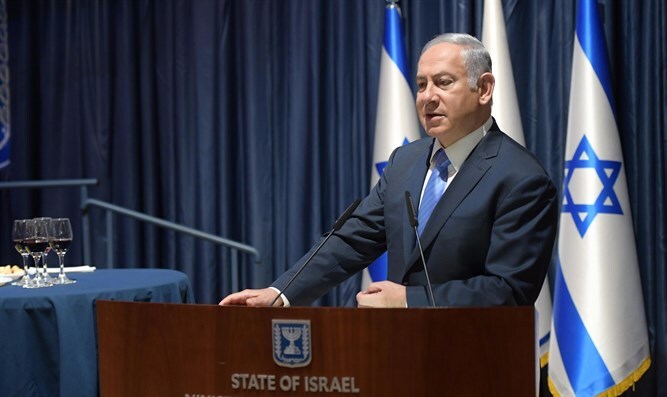 Turning to the issue of illegal Arab settlement on Israeli land in Judea and Samaria, Netanyahu said his government was committed to evacuating the unauthorized Bedouin encampment of Khan al-Ahmar, either by a mutually-agreed upon arrangement, or by a forced eviction. In September, the Israeli Supreme Court paved the way for Khan al-Ahmar’s eviction. Last month, however, the Netanyahu government voted to postpone implementation of the evacuation orders in an effort to reach an agreement with the town’s approximately 180 residents to relocate the encampment off of land belonging to the Israeli town of Kfar Adumim. Netanyahu vowed that Khan al-Ahmar would be evacuated one way or another, but at Sunday’s press briefing declined to give a final deadline for negotiations. “You want me to give a deadline before [the negotiations]?” asked Netanyahu rhetorically. Netanyahu shied away from questions regarding whether the government was accelerating the pace of construction in Israeli communities in Judea and Samaria, in particular the ‘E-1’ bloc between Jerusalem and Maale Adumim. “We did establish a new community,” said Netanyahu, referring to the establishment of the new town of ‘Amichai’ in Samaria, to replace Amona, which was demolished last year following a court order.